On our farm, we raise chickens, goats and sheep—all delicious creatures enjoyed by man and beast alike. Over the years, we’ve had to contend with coyotes, foxes, fishers, rats, crows, and hawks, all of them hungry and looking for an opportunity to feed. Of course, every chicken or lamb they take represents an economic loss, and sometimes an emotional toll. Stopping them is essential…and in some cases, frustratingly difficult. This is a never-ending job on just about every farm. Dairy and beef farmers certainly have known coyotes to take newborn calves. And although vegetable, fruit, and crop farmers may not call them “predators” per se, they too are always battling some form of bug, bird, fungus or rodent that seeks to consume their delicious product before they can harvest. Predators are one of the few constants a farmer can count on, year after year. Prevention is key when discouraging predation. In fact, we have two large guardian dogs exactly for this purpose. Canute and Lizzy mark their territory, patrol our land, and bark at anything unknown. As a result, they have created a “safety zone” that generally keeps coyotes and foxes at bay. They even keep the occasional sales person in their car! Animal housing should always be built with prevention in mind. For example, we built all of our chick brooders to be rodent-proof. (A “brooder” is a fairly tight, warm, dry place for baby chicks to safely grow for a few weeks before they develop feathers and can regulate their own body temperature.) Or rather, we thought we had made them rodent-proof. I’ll never forget the morning I went to feed 300 new baby chicks. We had just picked them up the day before, and had placed them in the very same brooder we had used a thousand times. That morning, I removed the panels of the brooder to find not one single chick…they had all disappeared overnight! All 300 brand-new, day-old peeping fluff balls were nowhere to be seen. As a child of 70’s television, I looked around for a moment to see if I was on “Candid Camera,” as if someone was playing a massive joke on me. Unfortunately, it was no joke. I investigated further and found that some creature had gotten through a very small hole and had killed and stuffed all the baby chicks into the barn wall. Unbelievable! Not only was my predator hungry, he was planning for the future. Once you have a predator problem on the farm, the next challenge is figuring out how to either outsmart or eradicate them to stop additional losses. After the baby chick episode, we reinforced the brooder and filled the hole. But knowing we had a voracious rat lurking around, I wanted him (or her) dead. (I felt a little like Al Capone in The Untouchables: “I want him dead! I want his family dead!”) My youngest daughter, Margaret—a lover of all small mammals and owner of two pet gerbils—campaigned hard for the rat, arguing he was “only doing what comes naturally.” My daughter’s pleas notwithstanding, I placed enough rat poison in the wall to kill our unwanted guest and perhaps several generations of his extended family. But I was careful to ensure our barn cats couldn’t gain access to the poison and ultimately was aware that there may be unintended consequences to using the poison: A cat or other carnivore (hawk or owl) might consume a poisoned rat, becoming an unintended victim. My inner-Capone was at peace as long as that rat was dead! 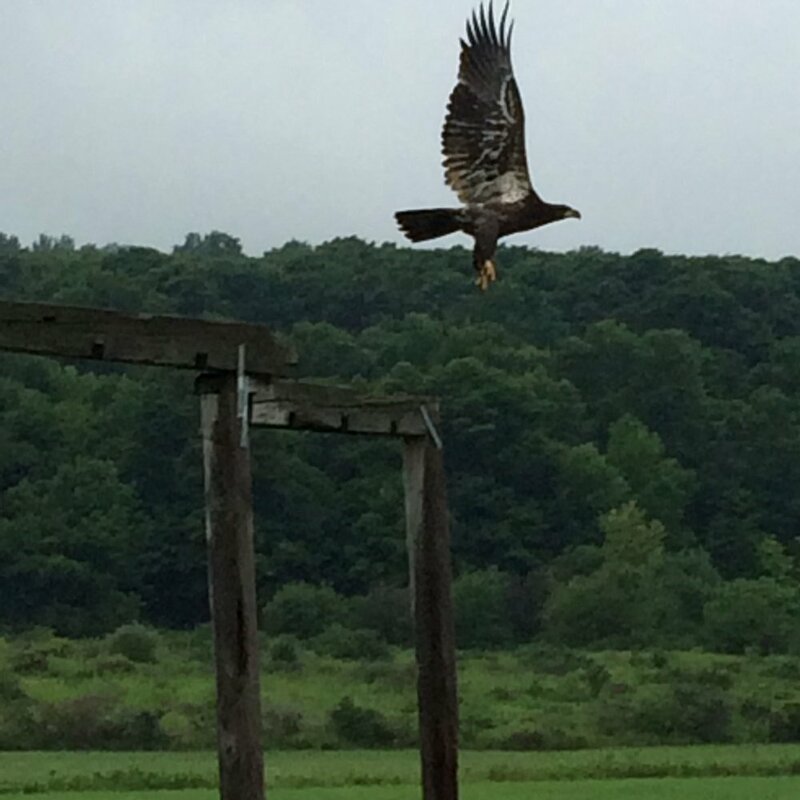 This last month, we had our most impressive predator yet: a juvenile bald eagle! “Bert,” as we liked to call him, was HUGE—3 feet tall with an enormous wing span. Bert learned that he could sit on a perch overlooking our pastured meat birds and have his fill… morning, noon and night. (Our chickens are not caged or under permanent cover; they are free to wander around a nice grassy, fenced-in area.) Bert simply swooped down to grab his lunch and proceeded to eat it on our neighbor’s rooftop. In fact, our neighbor Joanne called to report that she had seen Bert with a chicken foot in his mouth and that he had left a pile of feathers on her roof! As cool as Bert was, and as much as I loved seeing him every day, we couldn’t continue to lose chickens. But since he is protected under the Bald and Golden Eagle Protection Act, I knew eradicating him was not an option. Even if he weren’t protected, I doubt I could kill such a magnificent creature. But maybe I could outsmart a bald eagle? I called the New York State DEC to ask for their advice. The first half of the conversation was spent establishing that it was indeed an eagle taking my chickens. Apparently, my situation was quite unusual. Bald eagles prefer fish! The DEC agent had the following advice: Make it hard for him to feed. Make the penned area smaller. If you can’t build a structure to go over the chickens, make a visual barrier. Bald eagles are opportunistic feeders, with juveniles being quite transient. If he can’t feed, he’ll move on. So, I took the agent’s advice and adjusted the size of my pen. I purchased flagging tape and zig-zagged it across the top of the enclosure. All the adjustments made it difficult to do morning and evening chores, but if it saved our chickens, it would be well worth the effort. The very next day, in the early morning fog, I saw that Bert had brought two friends (Ernie and Big Bird? ), but there were no signs of a feeding. The flagging tape had them stumped! We saw Bert only one more time after that and he has since stopped coming by altogether. I’m at once both thrilled and saddened at our success. Bert was super cool! Before I became a farmer, I never had considered the challenges that predators present, nor fully appreciated how cunning these creatures are…and then how adaptable the farmer has to be to preserve her investment and livelihood. There are eight established bald eagle nests known to be in the Mohawk Valley region and I am so happy they are here. And I’m very happy to know what to do if I get another visit from Bert!